I've always been an Optima fan. My family has run them in everything that takes a car battery since the mid 1980s. 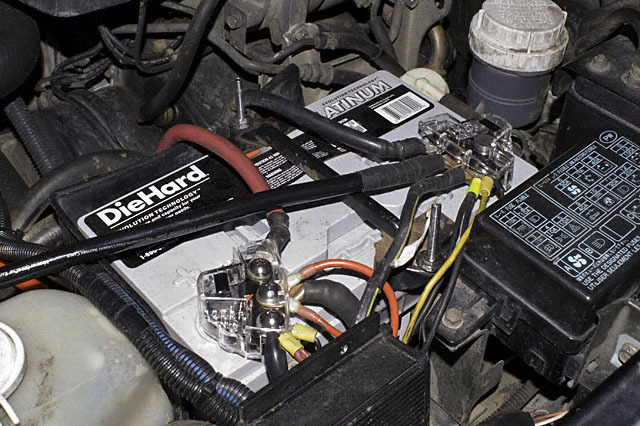 Their amazing durability and long life in everything from tractors, boats, RVs and hotrods to crawlers always made the question of what battery to buy for the next thing a moot point. With that understanding the decision to switch to a completely different manufacture was not done lightly or without some serious qualms. Unfortunately, Optima's apparent ups and downs with quality control and their lack of group 65 alternative for the Yellow or Blue top 'forced' me into a search I didn't really want to start. However, it turned out the search was worth it. The first thing I found out is that there are a lot of options for anyone searching for an Absorbed Glass Mat (AGM) dry cell battery now days. The second thing I found out is that there are only a few options if you want a GOOD AGM battery - one that isn't manufactured in China or the Philippines or somewhere else using slave labor. The third thing I found out is that most of what was left of my search was actually the SAME BATTERY with someone else's label stuck to the outside. That in itself isn't necessarily a bad thing but it is confusing when you're searching for batteries. So, after searching until I couldn't see straight I finally lighted on the Odyssey battery web site. These were batteries I was somewhat familiar with. A lot of the street rod and race crowd have run these for years and everyone seemed to be happy with them. Unfortunately, they're not cheap and while they may work great in a muscle car I wasn't familiar with anyone that had one in any kind of a serious off road vehicle. Still, the rumor was that Odyssey batteries were very durable and the warranty was pretty impressive. Kind of harkened back to the good old days of Optima. After a little more surfing I found Odyssey's PC1750 Group 65 battery. The Group 65 size is the largest battery that can be practically fitted in a Montero Sport without surgery. The Odyssey Group 65 is a BIG, HEAVY battery. It's not real tall but it is long and it weighs in at 60 lbs. The Odyssey just fits lengthwise with about an inch to spare on each end. Ok. So, I'd found a battery that fit, had the required storage capacity and I was relatively sure wouldn't croak and leave me stranded in the middle of the Utah desert somewhere. Unfortunately, the price was in the upper $200s. Eeak! Yea, I'd found a battery all right and for that price I'd better be REALLY happy with it. :( That's the problem with buying car batteries. It's not like you can buy one, try it out for a few months and then take it back for a full refund if you're not happy with it. Time for some more surfing. I'd need a lot more convincing before shelling out that kind of cash on a battery. same batteries as the Odyssey AGM batteries. 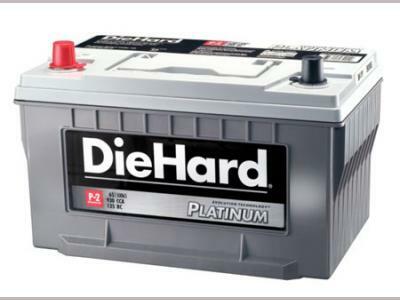 In fact, after some more research and a few phone calls I did find out that, yes, Odyssey does produce the Platinum AGM batteries for Sears. The only difference is cosmetic. Ok, the only difference is cosmetic and price. Almost a $100 dollars difference in price, in fact. $200 for the Platinum P-2 Group 65 was much more comparable to the old Optima Blue Top prices. 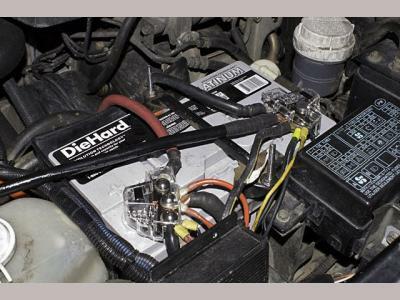 A quick trip to the closest Sears auto store and I had my new battery. A shiny new Sears Platinum P-2 Group 65. This is the 'rebadged' Odyssey PC1750. Something to note here. I didn't pick any particular Sears and Denver isn't noted for being a great place to find large stocks of any product. Nevertheless, when I walked in there was a large rack of several of every type of DieHard Platinum I'd seen on Sears' web store. That was a very pleasant surprise. I've long since gotten very tired of having to order Optima Blue Tops a week to two weeks in advance because no one in Denver wants to stock them. Time to install this puppy. I already knew the Platinum P-2 was shorter (height) and longer but I'd measured things well in advance so I didn't forsee any problems there. I also knew this was going to be a much heavier battery than stock. I liked the stock Mitsubishi J bolts as these are nice and heavy but I wasn't willing to chop mine up in case I ever intended to put the Optima (or other taller) battery back in. A quick trip to Napa netted me a pair of shorter, hefty battery hold down J bolts for about $8. So far, so good. Everything fit and there's still good clearance. Time to hook up the battery cables and see what happens. Ummm. This isn't good. Neither clamp fits. Both are too big. ??? Oh, yea, that's right. The Odyssey uses tin plated brass posts. Long ago I'd put 'inserts' into my original terminals because they'd enlarged themselves as lead terminals tend to do if they've been taken off and put back on about 200 times in 12 years. Taking the 'sleeves' off the Optima and putting them on the DieHard at least got me to the point where I could put the cables back on - more or less. Mostly less. Oh, well, I was planning on replacing the terminals anyway and they were on well enough to start and drive it until I could get replacements. So, on to starting and driving! The DieHard Platinum P-2 is about a 1/4 'more' battery than the Optima Blue Top and they're both AGM deep cycle starting batteries. Without going into mind numbing technical (and marketing) detail there's not really much difference otherwise. I expected a quarter more battery and that's pretty much what I got - both in physical size and capacity. The only specific thing I found with the Platinum P-2 that was somewhat unexpected is that it appears to take a charge much faster than either the Optima Blue or Yellow Top batteries. Otherwise, like I said above it's what I expected. Which turned out to be a good thing because two months after install I got to do a first hand, unplaned 'stress test'. Rolling out of Moab on vacation in April the alternator in my Montero Sport died just as we crossed the bridge heading north to Green River on highway 191. I already knew that the nearest replacement alternator was in Grand Junction at the AutoZone (my spare was back in Denver, of course) so the choice came down to trying to make it to Grand Junction before they closed and risk spending the night in the parking lot or continue on to Green River and check in to the hotel there. Moab was booked solid so no options there. Oh, and did I mention it was getting dark and it was warm enough to turn on the dual electric engine cooling fans? I was reasonably certain I could make the 85 miles or so to Green River on just battery power - the new P-2 had AT LEAST the power of my old Blue Top and I've pushed that battery to the hairy edge more than a few times. Live on the edge, I always say! An hour and a half latter we rolled into the hotel in Green River. The volt meter was reading about 11 volts. Well, I still had head lights so I was happy. The next morning after discussing our very limited options over breakfast I decided to continue on to Grand Junction to pick up a new alternator. I probably should have stopped at the truck stop and had them charge the battery back up but by this time I was more than a little curious to see how far I could push the new battery. Honestly, I expected the battery to be mostly dead by the time we rolled in the night before but when I went out to start the truck up in the morning it started just fine and the needle was sitting right around 11 volts. Like I said, live on the edge. Another hour and a half latter we rolled into the AutoZone with the volt meter hovering around 8.5-9 volts. It was obvious by this time the battery was seriously discharged. Thankfully it was cool enough that the fans didn't come on much and I didn't need head lights. Still, after installing the new alternator my Sport started without so much as a hic-cup. About 170 miles on battery power isn't bad especially for an electricity sucking computer controlled vehicle. It's been a year now that I've been running the Sears Platinum P-2 Group 65 battery and its been great. I've accidently left the interior lights on (over a weekend) half a dozen times and I've discharged the battery to the point the vehicle wouldn't start a couple times and it behaves no differently than it did when it was new. I've also spent 30-40 minutes at a time running my Warn XD9000 winch pulling vehicles out of the snow and back onto trails and that barely touches the battery. One thing I have to say - this battery has a lot of reserve capacity. So, overall I'm extremely pleased with the DieHard Platinum P-2. I have to agree with the many comments I've read. Odyssey does appear to produce a very high quality product.